The Rivanna Trail was recently profiled as a featured trail by the National Recreational Trails Program. It's a great piece, describing what makes the RT a valuable part of the community. There will be some stream stabilization work starting this week (sometime between October 19 and October 23) in the vicinity of the trail segment that parallels 5th Street, behind Hardees. The trail will be detoured to stay on the 5th Street sidewalk during the work. Francis Fife, a true public servant, died this morning. He was 95. Funeral arrangements are pending. Francis was a remarkable man with a remarkable record of service to the community, including eight years on City Council and a term as Mayor from 1972 to 1974. He was a founder of the Charlottesville Housing Foundation and served on the Board of Piedmont Housing Alliance from PHA’s inception until his resignation this past year for health reasons. He was also a founder and President of the Rivanna Trails Foundation, and he served on the Board of Advocates for a Sustainable Albemarle Population. He was mayor at the time of the vote to approve the Downtown Mall, though because he was a Vice President of what was then Virginia National Bank (now part of Bank of America), which had an office on the Downtown Mall, he recused himself. He was proud of an unpopular vote for scattered-site public housing. He was also proud to support the Ivy Creek Foundation, around the time that he was mayor. He was a gentle, humble man who will be greatly missed. Rescheduled due to weather If you plan to be in Riverview Park on Wednesday, February 25, be on the alert for blasting at the existing Rivanna Pump Station located at the entrance to park (intersection of Chesapeake St. and Riverside Ave). A single blast is anticipated mid-day. Crews will be working on the 16th to drill holes in preparation for the blast. Vehicular and pedestrian traffic will be temporarily stopped on the adjacent roads, trails, and at the park entrance in the vicinity around the pump station at the 5-minute warning horn/siren before the blast. There will be another horn/siren sounded right before the blast, and then a prolonged horn/siren following the blast when the blaster has confirmed the site is all clear and then normal traffic patterns will resume. Please note that the park will not be closed. Several seismographs will be set up in the Woolen Mills neighborhood to gather vibration data. We appreciate your cooperation to adhere to all signage and personnel regarding blasting for your SAFETY! In addition to our own monthly work party, our friends at the Charlottesville Area Mountain Bike Club are hosting a work party at Ragged Mountain. RTF has worked with the city over the past couple of years to restore and build trails around the new dam and expanded reservoir, and CAMBC is continuing that effort. RTF. . . CAMBC. . . one day, two great work parties. Take your pick and show your love for local trails on Valentine's day! Click here for details on the RTF Monthly Work Party; details on CAMBC's event are below. 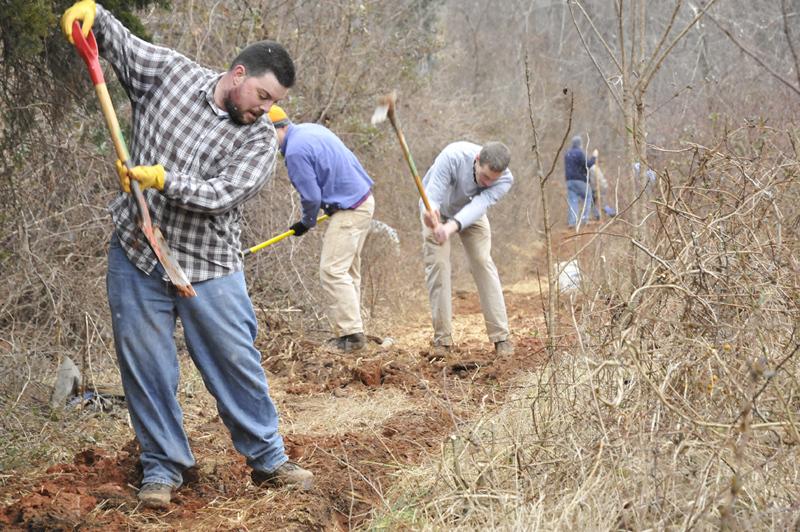 What: First ever CAMBC/City of Cville workday at Ragged Mountain. Help punch in a critical section of trail that gets us closer to having the first loop around the reservoir. How good is that? At 9, we'll have a very short briefing on safety, project overview, and logistics. Where: Ragged Mountain dam parking lot. Note that this is not the old lower parking lot, but the upper, new one. If you aren't sure, keep going uphill past Camp Holiday Trails until the road ends at the dam. We need to haul people to the work site, which is about a mile away. If you have a 4WD vehicle, please bring it to help haul people from the parking lot. Notable extra: For those who can stick around, CAMBC will be supplying a simple grill-out after we are done, at the parking area. Nice! Bring a plate so we don't generate a bunch of trash. What to bring: If you have any trail tools (especially digging tools like rogue hoes, pulaski's, digging hoe, etc.) bring them. We don't know how many folks are planning to attend, so bring whatcha got. Wear hiking boots and prepare for cold. Bring work gloves. 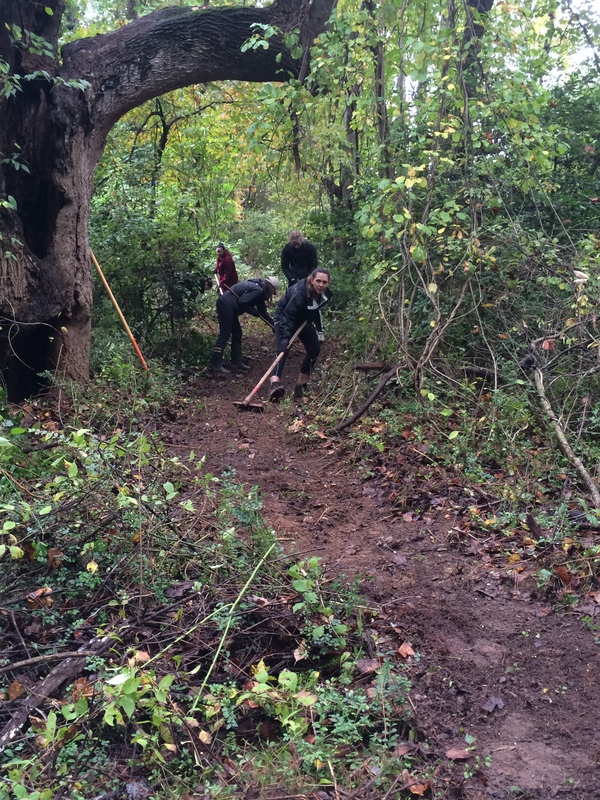 With the help of students from UVa's Alternative Fall Break, the October work party began the task of reopening a spur trail running just west of the Warner Parkway. The original trail was closed during construction of the Parkway, and had become totally overgrown and impassible over the past few years. The reopened spur starts along the fence at the west side of the CHS football field on Melbourne Road, and runs north about a quarter mile. The trail ends at the old-growth kudzu patch, but future work parties will clear through to Meadow Creek at the culvert, making a mini loop with the RT on the east side of the Parkway. 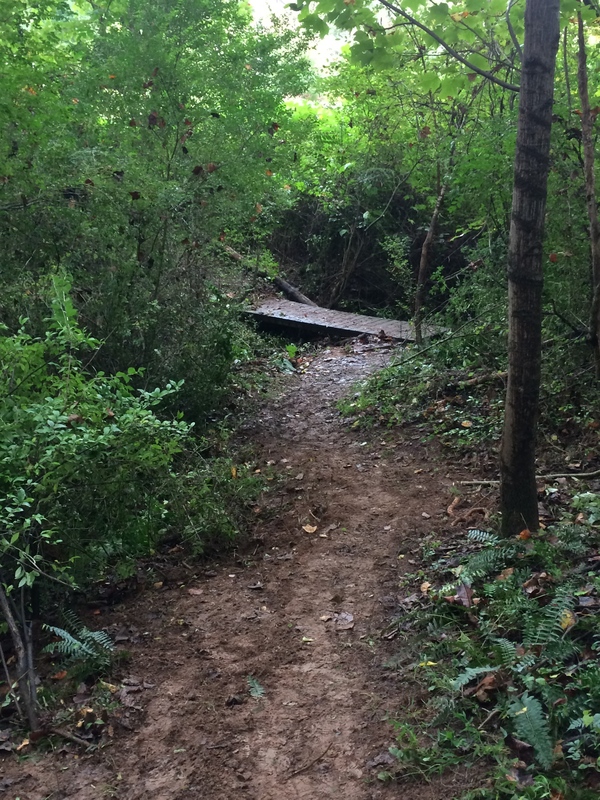 Even in its incomplete state, it's an addition to the Rivanna Trail worth exploring. AmazonSmile is a program where Amazon donates 0.5% of the purchase price of eligible products to charitable organizations - including the Rivanna Trail. 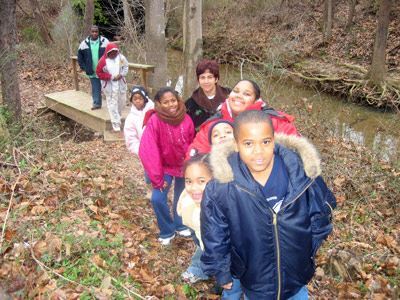 If you shop at Amazon, connect via this link to have a portion of your spending support the Rivanna Trail. The City of Charlottesville is currently revising its 2003 Bike & Pedestrian Master Plan under the leadership of Amanda Poncy, the city's biking and pedestrian coordinator. As many of you know, the RTF participated mightily in drafting the 2003 Plan, and we are grateful that the city has done so much over the years to support the Rivanna and other trails. As part of this current project, the city has posted an online interactive map through which people can indicate desired routes or destinations, including ones in the county. One must register and log in, but does not have to be a city resident to do so. Participating in this mapping activity is a great way to expand and help protect our trail system. Thanks for all the ways you help the RTF. The RTF celebrates Virginia National Bank's "e-statement campaign," the proceeds of which will help us build a new pedestrian bridge. If you would like to volunteer engineering expertise, construction skills, or heavy equipment donations to this project, please contact us. Here are details from our most recent letter to RTF members: "As our city evolves and grows, so does the importance of a trail system that serves a diverse group of city residents. Thanks to a close partnership with the Charlottesville Parks and Recreation Department, the Greenbrier Neighborhood Association, and Virginia National Bank we are on the verge of building the first in a series of bridges over the newly restored Meadow Creek. This is the first step within a larger plan to create a new multi-use trail through the entire Meadow Creek Valley, connecting the paths along the John Warner Parkway to Highway 29 North. By building multi-use trails like these, which co-exist with our rustic footpaths, we can preserve the classic RTF trail experience while expanding the accessibility and commuter value of our trail system." The RTF Board would like to thank its faithful and generous supporters who have recently sent in financial gifts, its incredible trail adopters and work party volunteers who have braved recent rains and snows to maintain the trail, and visionaries who have presented us with plans for new or improved trails. The Board would also like to give you an update on the Route 29 Western Bypass and its potential impacts to the Rivanna Trail. Depending upon final design, the Bypass’s southern interchange could negatively impact or destroy up to a mile of the Rivanna Trail between Barracks Road and Old Ivy Road. In September of 2012, we informed you of an information meeting that gave the public an opportunity to provide comments to VDOT about the Bypass’s southern interchange. At that time, the RTF Board expressed its concerns and requested that all future maps of the roadway include the Rivanna Trail. VDOT obliged, surveyed the trail, and included it on future maps. In 2013, the Federal Highway Administration designated the Rivanna Trail in the area of the southern interchange to be a “section 4(f) resource.” In layman’s terms, this means that the FHWA deemed the Rivanna Trail to be an “important public recreational resource,” requiring VDOT to include a mitigation plan for protecting or improving the trail. VDOT has offered a rough draft of a mitigation plan, but the Board is awaiting more details before making any decisions. On February 5, the RTF Board presented a letter to the Albemarle County Board of Supervisors supporting the BOS’s agenda item of deciding whether or not to hold a public hearing about the Bypass. The BOS voted 5-1 to hold a hearing. What can you do to help protect the Rivanna Trail from impacts of the Route 29 Western Bypass? You may address your concerns about potential negative impacts to the Rivanna Trail at a public hearing about the Bypass sponsored by the Albemarle County Board of Supervisors on February 19. You may write a letter about your concerns to the Albemarle County Board of Supervisors, to Virginia Governor Terry McAuliffe, or to Virginia Secretary of Transportation Aubrey Layne. Again, we thank you for the many ways you support both the RTF and the RT.